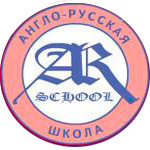 Concord College, the British partner of Anglo-Russian School, was founded in 1949 – it has always been international in its outlook and typically has students representing 46 countries. There is a strong tradition of entry into the more prestigious universities. We provide skilled and sympathetic teaching and learning environment which encourages students to do their best and achieve the highest standards possible. Education. Teaching is mainly in the traditional situation of classes of between 10 and 15 students, although some special classes are smaller. Structured and supervised private study is a necessary part of successful education, and students spend two-and-a-half hours each evening on such study. The Internet is available for student use and most have an e-mail box to keep in touch with friends and family. We have seven well-equipped science laboratories. A range of some of the latest computers is freely available for students who wish to specialise or who have a keen interest in computer studies. For English and modern language teaching, the college has a sophisticated language laboratory with audio and computer-aided learning. Overseas students. Students from over one-third of the world’s nations have been educated at Concord. Most overseas students go on to attend university in Britain. It is very important that our students can operate confidently and accurately in the English language and therefore the teaching of English as a foreign language (T.E.F.L.) is an important part or the curriculum. 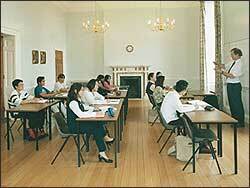 Students are accommodated in single study bedrooms, or in twin bedded rooms. 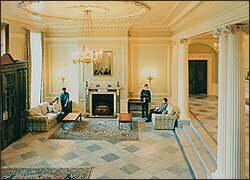 All the rooms are centrally heated,carpeted and have individual wash-basins. Summer course. During July and August the College uses its teaching resources, facilities and expertise to provide short intensive courses which combine a full English Language programme with a wide range of sporting and social activities for students from all over the world. We believe that students enjoy the Summer Course and benefit from it greatly. It provides an excellent opportunity to improve English language skills, to enjoy a very full and wide ranging social and recreational programme,to see something of Britain and to enjoy the company of young people from all over the world, and all this in a safe and caring environment. All students are tested on their first day and placed in classes according to their level of English. The maximum class size of only 12 ensures that students have many opportunities to practise and improve their English each day and get individual help with their problem areas. Students receive 20 hours of tuition per week. Sport. 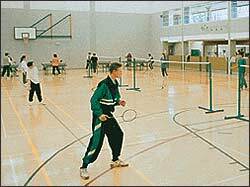 A wide range of outdoor sports and indoor sporting activities is available.None is compulsory and many have been suggested by students themselves. Soccer, basketball, rugby, volleyball, cricket, golf, tennis, hockey, climbing wall, table tennis and badminton are all very popular. Students can take up archery, canoeing, horse-riding, or practise karate. We also have an indoor heated swimming pool and large sport hall. From 2002 the Anglo-Russian School educational programme will be run from the Secondary Comprehensive School № 497 of the Central Department of Moscow Commettee of Education, situated in the centre of Moscow (Taganskaya metro station). Since 1999 School № 497 has been accommodated in a new, specially designed building. School № 497 provides well equipped classrooms, language laboratories, computer rooms all with Internet connections, a well stocked library, reading and video rooms, gymnasium, sports facilities and a theatre. The school is equipped with both cable and satellite television. Psychological guidance is a feature of the school, and a medical service is available. Catering services are also provided. A well-structured learning environment and a caring atmosphere created by highly qualified and experienced teachers, encourage students to fulfill their potential and achieve the highest possible standards in class. Class numbers do not exceed twenty five. Individually orientated teaching aims at increasing independence whilst acquiring knowledge. The school provides individual educational plans and learning development strategies. These include olympiads, project work, excursions, creative competitions, non-traditional lessons and external education. The school has collaborative agreements with Moscow Teachers’ Training University, Moscow Institute of Electronics and Mathematics, and The Moscow Academy of Design and Technology. a wide range of extra curricular activities: computer club, TV-studio, ballroom dancing.